Even with the generation change, there’s no way you’re mistaking the hatchback for anything else but a WagonR. It’s unabashedly boxy and carries over the same basic formula of tall height and XL-sized windows. There’s some novelty here, though. For instance, Maruti Suzuki has added a small sliver of chrome inside the headlamp for that premi um touch. A portion of the C-pillar has been blacked out to give it that floating roof effect. The rear too now features larger tail lamps that extend towards the roof. Sadly, all the bling features we’d want, like daytime running lamps and alloy wheels, are missing. We’re told that alloy wheels will be offered as an accessory at the dealership level. The cabin of the WagonR 2019 will be a familiar place for most. Here too, the basics are well thought of. The dashboard is upright and flat, opening up more space for the passengers. Then, there’s a healthy amount of storage space with the twin gloveboxes, a bottle holder in each door and the central cubbyholes. Sure, Maruti Suzuki isn’t breaking new ground as far as design is concerned. It looks a bit staid, if we’re polite. That said, there’s plenty of new features to be excited about. For starters, there’s the steering wheel from the Ignis (with controls for the audio and calls, no less), and a funky looking instrument cluster. Topping things off is the new touchscreen infotainment system. 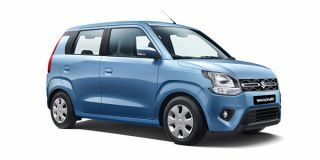 As far as safety is concerned, the top-spec WagonR will get dual airbags and ABS. Lower variants are expected to get at least a driver’s airbag as standard.